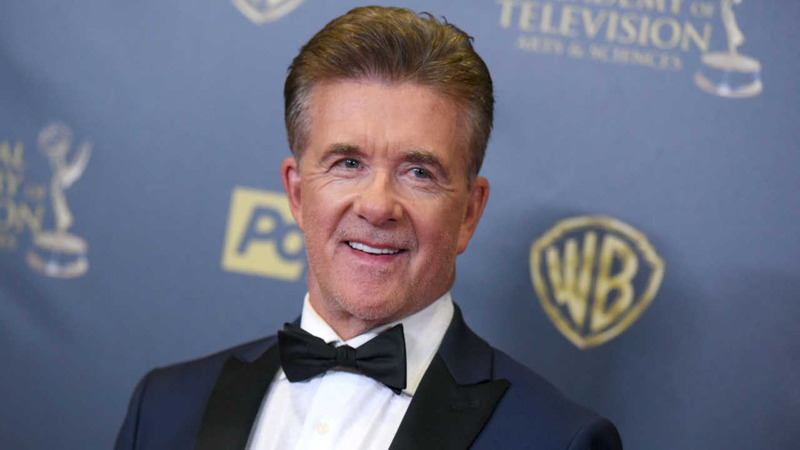 LOS ANGELES -- Alan Thicke's 1980s TV dad credentials were neatly in order on "Growing Pains." His Dr. Jason Seaver was an open-hearted parent and an enlightened husband, working from home to help tend the kids while his wife revived her career. But Thicke's character anchored a sitcom that was also 1950s-retro, part of television's renewed embrace of the traditional nuclear family after a string of single-parent shows. "Growing Pains" debuted in 1985, one year after "The Cosby Show" showed the old formula could be made new. While Bill Cosby's NBC series touched on social issues, ABC's "Growing Pains" was pure comfort food about a suburban family with a genial, father-knows-best patriarch, cheerful mom (Joanna Kerns) and a brood that included breakout heartthrob Kirk Cameron as teenager Mike and, in the show's final 1991-92 season, Leonardo DiCaprio. Thicke, who died Tuesday at age 69, said a 1985 interview with The Associated Press that he wouldn't have pitched a show like "Growing Pains" but suggested it fit the times. "Ronald Reagan is president and there's no war, maybe that creates an environment for a show like ours," he said. The Canadian-born TV host, writer, composer and actor died of a heart attack, said Carleen Donovan, who is a publicist for Thicke's son, singer Robin Thicke. She had no further details. "I spent Monday through Friday for seven important years with Alan Thicke as my 'TV dad,'" Cameron said in a statement. "I'm shocked and truly heartbroken today at the news of his death. Alan was a generous, kind and loving man. I am so blessed to have grown up with him." Other celebrities who had crossed paths with Thicke, whether through music, acting or simply as friends, expressed their sorrow at news of his death. "I grew up watching him and got to know him through Robin. He was always so kind to me," John Legend posted on Twitter. Thicke's fellow Canadians also responded quickly. William Shatner posted on Twitter that he was saddened by his loss, and singer Anne Murray's Twitter post said she was "shocked and devastated," recalling him as a friend and the writer-producer of many of her TV specials. The Edmonton Oilers weighed in as well. "RIP to one of the great ones, Alan Thicke," was posted on the hockey team's website, with a photo of a youthful Thicke and Wayne Gretzky on the ice. Born in Ontario, Canada, in 1947, Thicke was nominated for three Emmy Awards for his work in the late 1970s as a writer for Barry Manilow's talk show, and later for a satirical take on the genre in the variety show "America 2-Night." He composed several popular theme songs, including the original theme for "The Wheel of Fortune" and other shows including "The Facts of Life" and "Diff'rent Strokes." Perhaps his boldest assault on the U.S. market was as a virtual unknown taking on the King of Late Night, Johnny Carson. "Thicke of the Night" was a syndicated talk-music-and-comedy show meant to go head-to-head against NBC's "The Tonight Show Starring Johnny Carson." It premiered in September 1983 with great fanfare, boasting an innovative format and regulars including Richard Belzer, Arsenio Hall, Gilbert Gottfried and Fred Willard. But all too quickly, it was evident that Carson wasn't going to be dethroned, and the ambitious "Thicke" disappeared into the night after one season. "Certainly everything I needed to learn about failure, struggle, damage control, career rehabilitation and ego bashing I learned in that," he said in a 1995 interview with the AP. In an email, Loring described Thicke's passing as "a shock. We were all just together for Thanksgiving. He was funny, talented and deeply devoted to his family." In the 1990s and beyond, Thicke stayed busy as a celebrity TV host and with guest shots on dozens of series, including "How I Met Your Mother" and, this year, the Netflix series "Fuller House" starring Candace Cameron Bure and the NBC drama "This Is Us." "You were a part of my family and hockey family. You will be greatly missed. My heart hurts," tweeted Bure, sister to Kirk Cameron. Upon hearing the news, actor Bob Saget who plays Danny Tanner on 'Fuller House' tweeted his condolences. Thicke's last tweet on Tuesday was in reference to his cameo on the show. Thicke was a hockey fan, frequently attending LA Kings games. He took credit for introducing the sport to celebrity friends. He began playing at age 5, but acknowledged he wasn't very good at it. "You were expected to play," he said in 1998. "I was never good enough for the big time, but I always had fun at it." In 2003, Thicke received 30 stitches and lost five teeth after he was struck by a puck while practicing for a celebrity fundraising hockey game. "I won't be playing any leading men roles in the next couple of months," he joked after the accident. Thicke also leaves a son, Carter, from his marriage to second wife Gina Tolleson. He had been married to Tanya Callau since 2005.